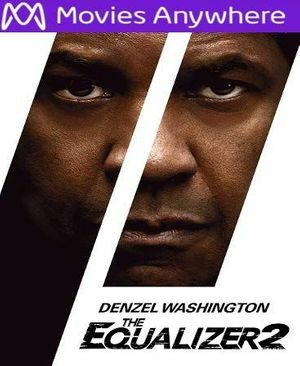 Digital UltraViolet and Digital Copy will makes it possible for you to stream the movie The Equalizer 2 HD UV or iTunes Code instantly to your computer and compatible Smartphones, Andriod, iphone, iPod Touch, iPad and tablets devices anytime, anywhere. You can also download a Digital UltraViolet Copy or a Digital Copy of the movie The Equalizer 2 HD UV or iTunes Code to your computer and compatible devices. 5.0 out of 5 stars Sometimes the Sequel is better than the Original. He's back....Denzel Washington returns as retired US intelligence agent Robert McCall, an update of the old Edward Woodward action TV show from the Eighties. But there's nothing about the Eighties here. McCall, now a driver for Lyft(?) cab company, exchanges words with strangers, hears snatches of their life stories, and if the passenger has been a good boy, he gets some friendly advice, and even more. If he's been a bad boy, watch out. All of this goes right up his soul-searching street. Welcome to urban melancholy. Washington is perfect as the calm, quiet Avenger; sipping tea at night and reading old classic books. Alone. Several violent interludes begin the film, and frankly, they never stop. A massive, growing ocean storm swallows up the fast-hitting finale, swelling along with the action, as McCall dukes it out with 4 rogue agents; wind and rain everywhere. Give credit to director Antoine Fuqua, and two screenwriters for an exciting, economical story. Denzel Washington, at age 62, is still an action-star. "Equalizer 2" may not even be an action-movie. Maybe it's a John Wayne Western, caught up in a time-warp, somehow lost in 2018. A good director, a great actor. All things are possible. In "Equalizer 2", possible becomes reality. Bill Pullman and Timothy Bottoms have supporting roles. Denzel Washington said he would never do a sequel to any of his movies. Never. That is, until now.